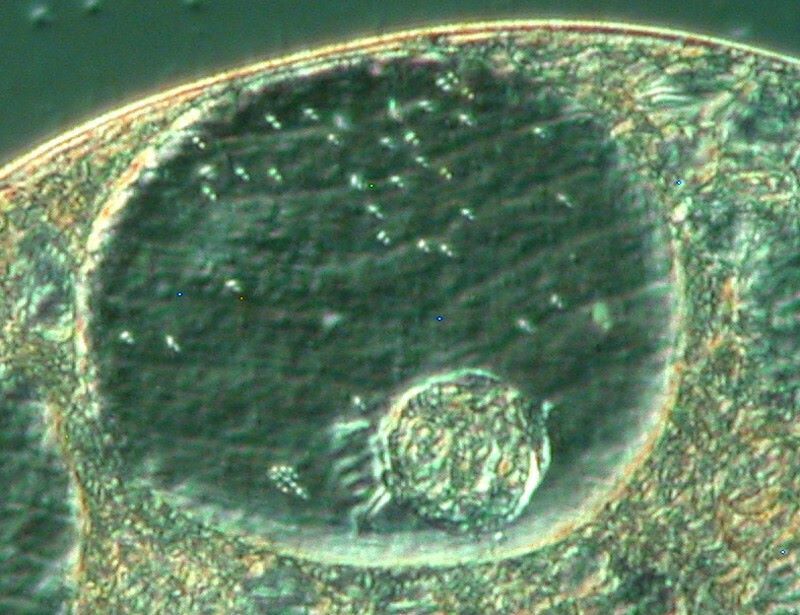 Blepharisma Album: A Fascinatingly Bizarre Protozoan. Or the Pink Micro-Cannibal. O.K., let’s get the formal, quasi-technical stuff out of the way first, so we can have some fun examining one of Nature's very bizarre beasties. There are about 40 species of Blepharisma and one of the most common is B. japonicum which is the one we shall mostly be concerned with. Most species have a distinctive pink pigment which is unique and this is called blepharismin. If cultures are kept in circumstances where there is little light, the color intensifies and becomes a deep red. This pigment has extraordinary properties; it is photo-toxic, that is, in prolonged intense light it will kill off the Blepharisma. You can observe this process for yourself under the microscope, by focusing a strong beam on a slide containing Blepharisma. This photosensitivity in natural circumstances acts as a biochemical signal which helps keep the organism at a productive place within the water column of a pond or lake. 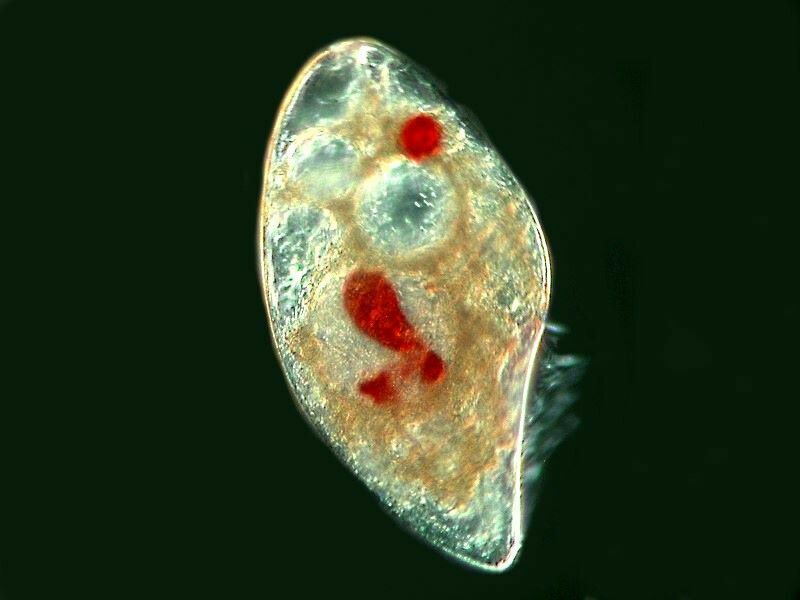 In other words, the organism is signaled to stay out of the upper layers where the sunlight is intense and down further where many planktonic, and possible food organisms thrive. It seems likely that this toxicity of the pigment may also discourage potential prey. Recently, it has been discovered that blepharismin may be effective in attacking MRSA (Methicillin Resistant Staphylococcus aureus). This could prove to be a very positive weapon in fighting off these kinds of infections, especially in hospitals, clinics, and other therapeutic environments. However, it should be noted that there are some species which apparently do not possess this pigment. 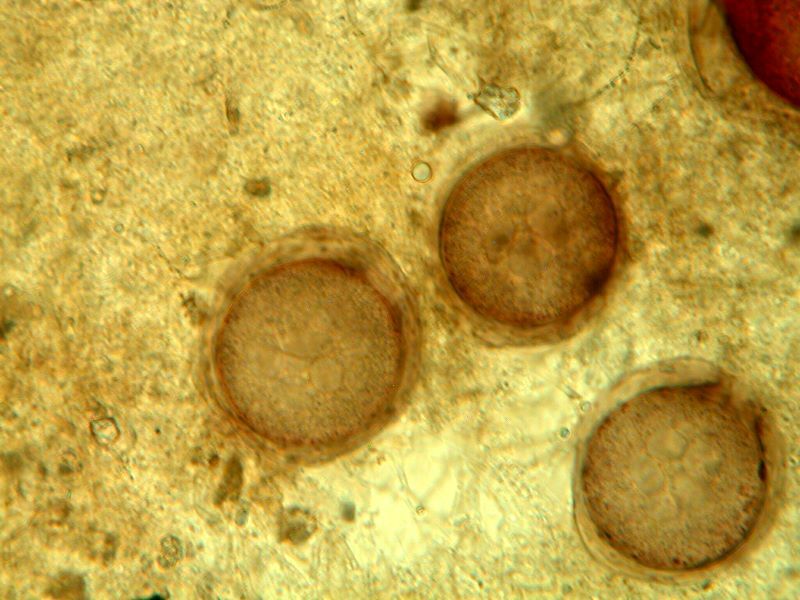 B. japonicum, however, certainly does possess it, is fairly easy to culture, forms distinctive cysts, and is cannibalistic. The triggers for this behavior are not fully known. Overcrowding may very well be a factor. As you can see in these photos from a rich culture, the organisms are very densely concentrated. 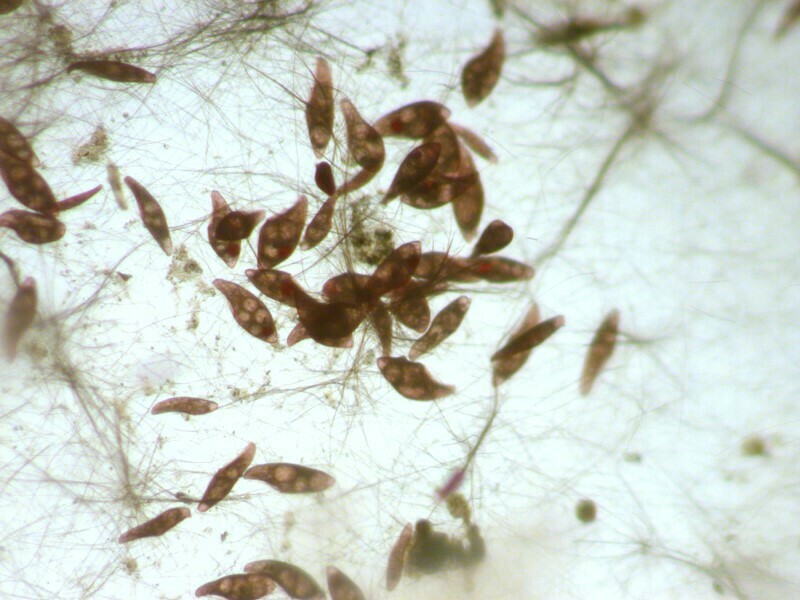 However, two significant problems remain: 1) There is still an abundance of other food organisms, such as the small ciliates Colpidium and Halteria. So, why attack and devour its own? 2) In a pond or lake, it is highly unlikely that such dense concentrations of Blepharisma would occur on a regular basis in such a way as to trigger cannibalism. When specimens ingest their own kind, they are known as cannibal giants. Here are what might be described as “before” and “after” photos. A very distinctive event takes place. Look at the intensity of color in the food vacuole. 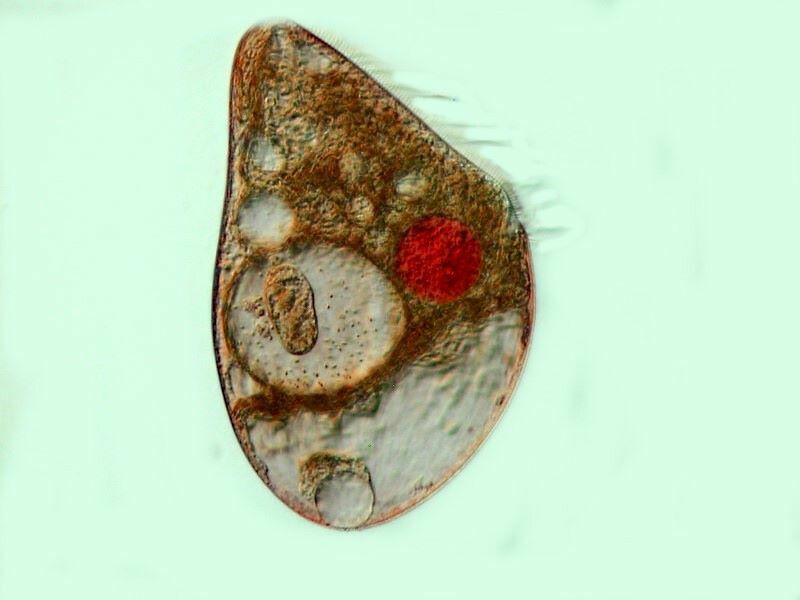 This Blepharisma has eaten another and in the food vacuole where it is being digested the pigment becomes bright, intense red. 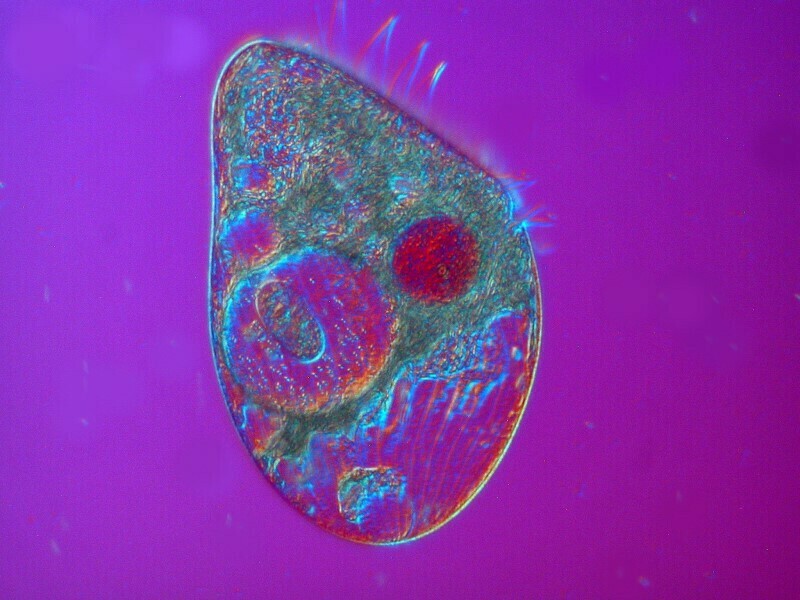 Now that we have a grasp of a few of the basics, let’s look at a bunch of images which I have experimented upon to try to reveal some of the most intriguing aspects of this organism. 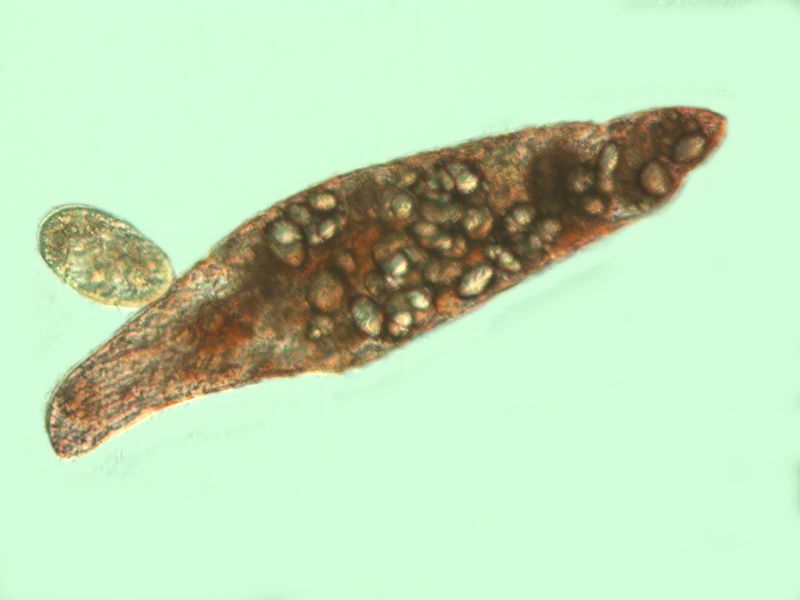 First off, let’s take another look at a “normal” B. japonicum which has been feeding on small ciliates. However, as I mentioned earlier, these creatures are really voracious. Here is an example. 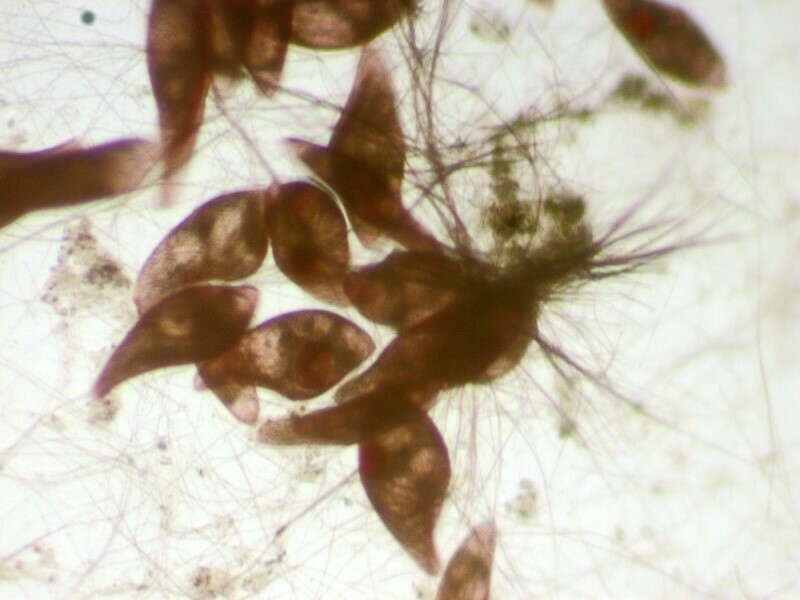 There is a Colpidium on its aboral side, which it might go after, buit most interesting here is the remarkable number of food vacuoles filled with organisms already in the process of being digested–well over 20! I decided to try some computer graphic transformations and initially used the “invert” function. 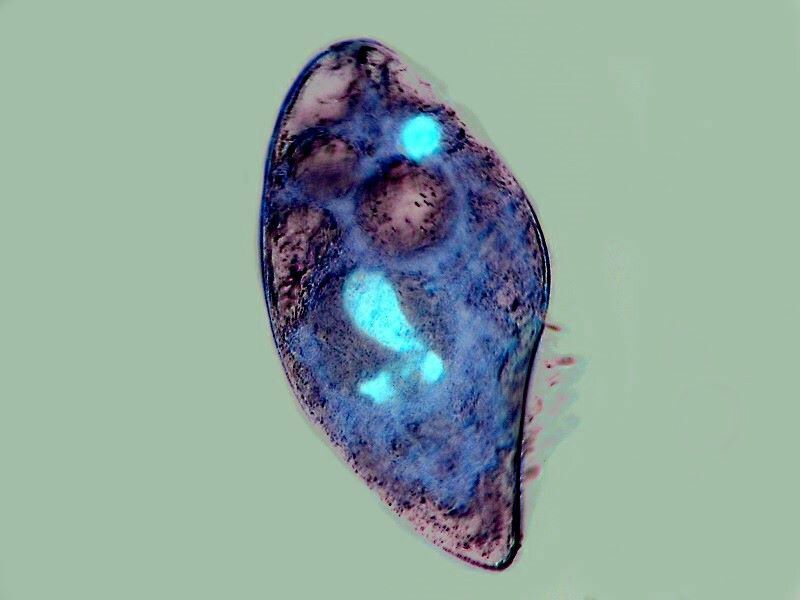 I was struck by how the vacuoles containing a Blepharisma show up as a distinctive blue creating what one might call a pseudo-fluorescent images. As you can imagine, this led to wild experimentation of the sort that gets raised eyebrows and frowns from purists. 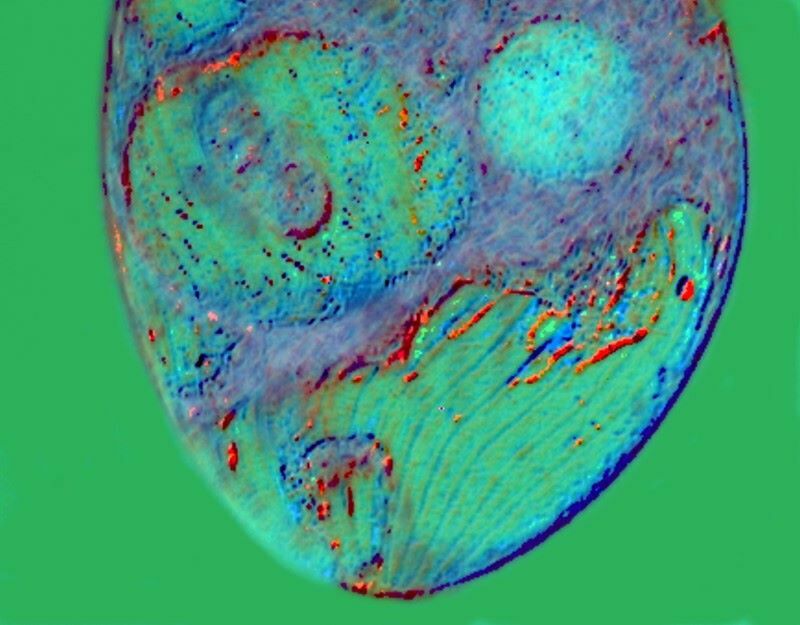 My retort is that microscopists doing electron microscoopy, especially SEM, and laser confocal microscopy, frequently add or augment color in images, as do astronomers, on a regular basis. So, once again, I say, let’s have some fun. Cannibal giants often become highly distended. 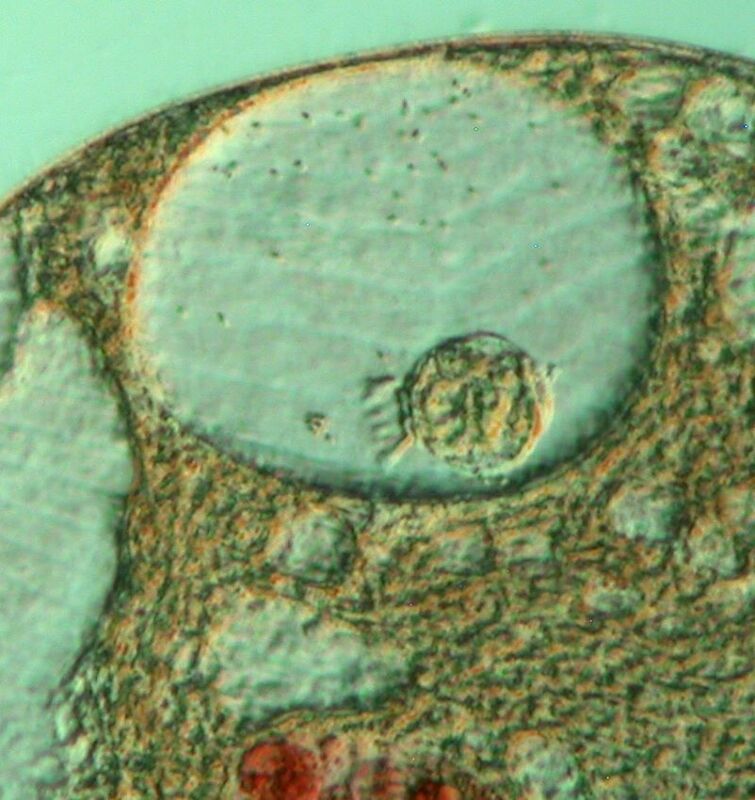 Here is a specimen digesting one of its kin and it has another large vacuole containing an Halteria grandinella. When I apply the “invert” function, I again get a pseudo-fluorescent image. 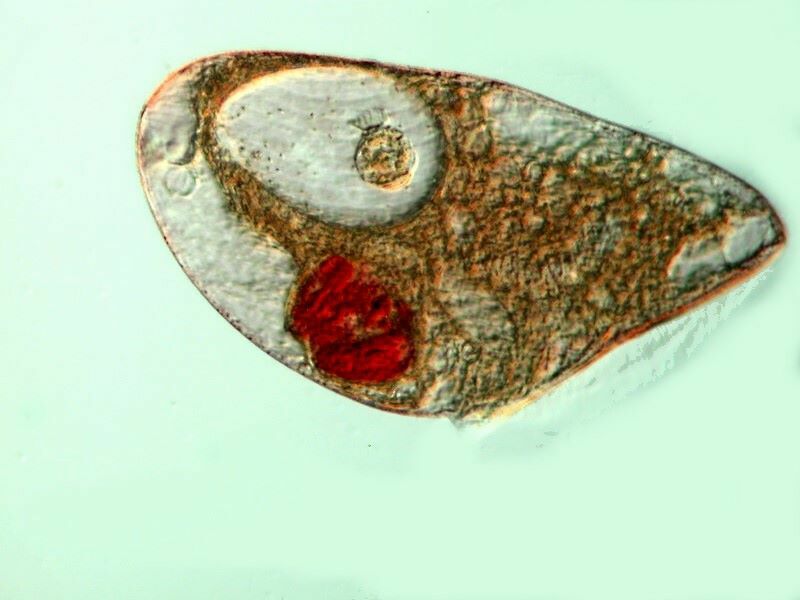 Further applications of functions called color cast and color background still show the vacuole with the Halteria while modifying the ingested Blepharisma back to a reddish-orange. The more I experimented with these modifications, the more I became convinced it’s not simply a matter of achieving a “pretty” picture with “groovy” colors. The images acquired by the application of different graphic techniques can, if we are attentive, open up detail that might not have been as noticeable in other more standard images. A feature of Blepharisma which I haven’t yet mentioned is its undulating membrane. This can be seen in the image below. And again, it’s quite distinctive in a graphics pseudo-Rheinberg image. An even more amazing example of the expandability is shown when a specimen becomes cannibalistic and begins engulfing prey its own size. 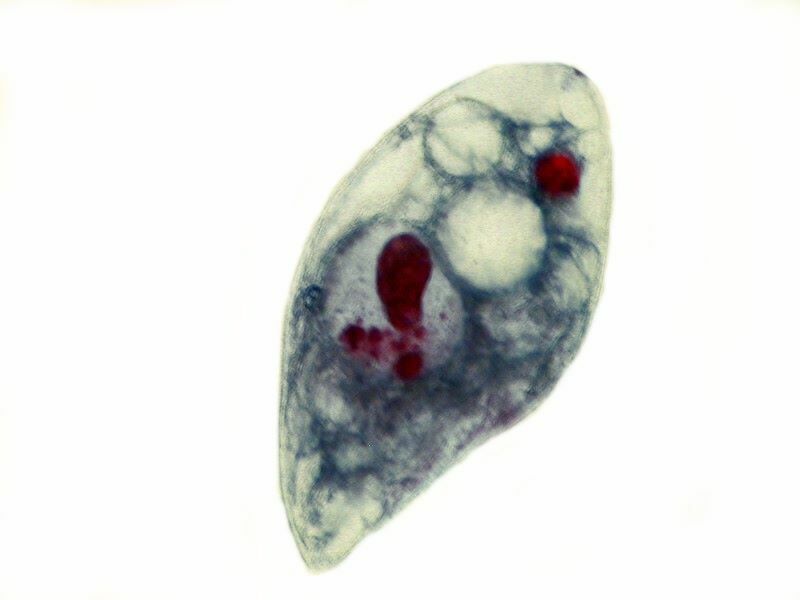 The next image is a closeup showing a vacuole (red) containing a Blepharisma already well along in the process of being digested and another large vacuole containing a Colpidium. 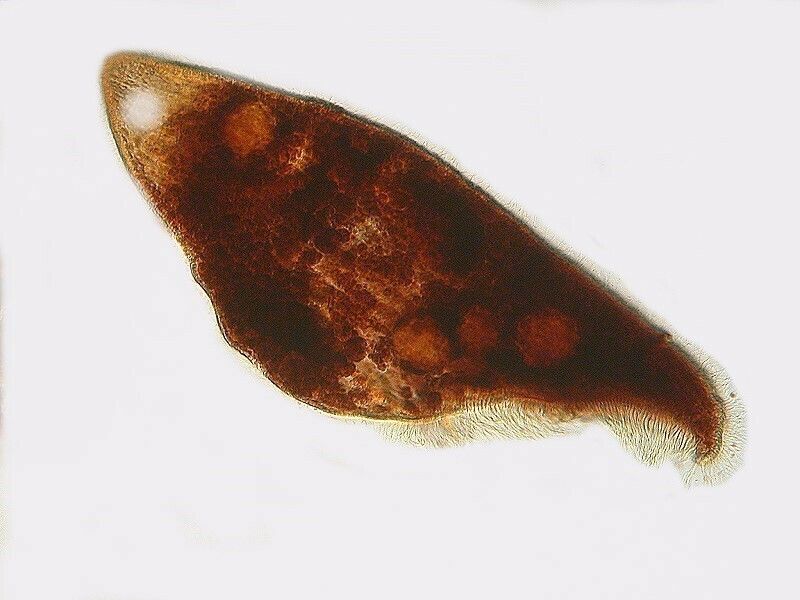 However, Blepharisma is an opportunistic feeder and will readily accept even smaller prey such as Halteria. 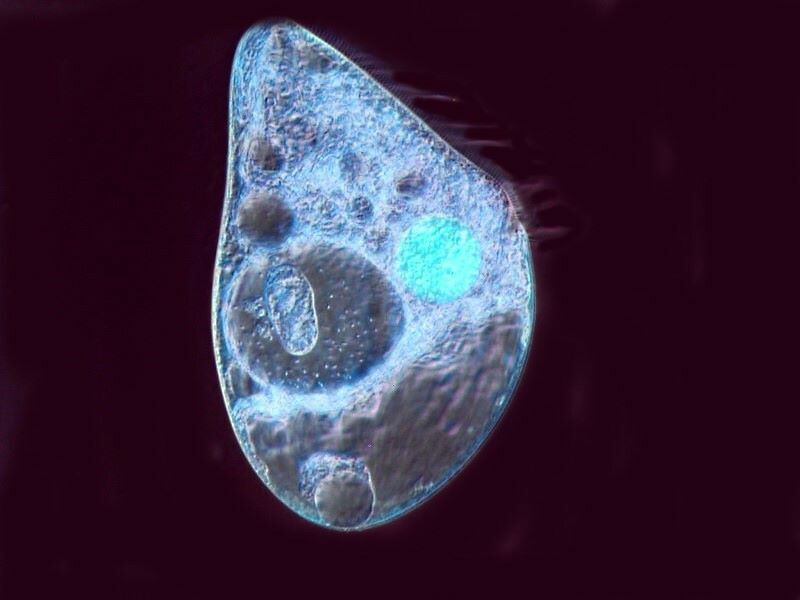 I want to show you 2 closeup images of a large vacuole containing an ingested Halteria. This second image is of particular interest for 2 reasons: 1) the detail of the Halteria suggests that it was ingested very recently and the process of digestion has not yet progressed very far and 2) on the surface, one can see a series of more or less parallel lines stretching across. These are kineties to which the cilia connect. 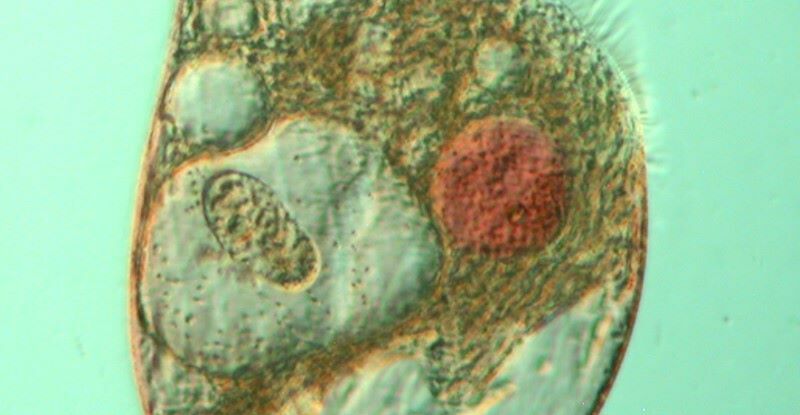 I then did another closeup on a different specimen with 3 sizeable posterior vacuoles and the largest one shows the kineties very clearly with the help of a bit of computer graphics magic. Blepharisma has another significant surprise for us; it has highly specialized survival techniques. When a specimen “judges” its environment to no longer be suitable, extraordinary things start to happen. Here is one of the advanced stages. Now, you must admit that this doesn’t look much like the Blepharisma we have come to know and love. What’s going on? 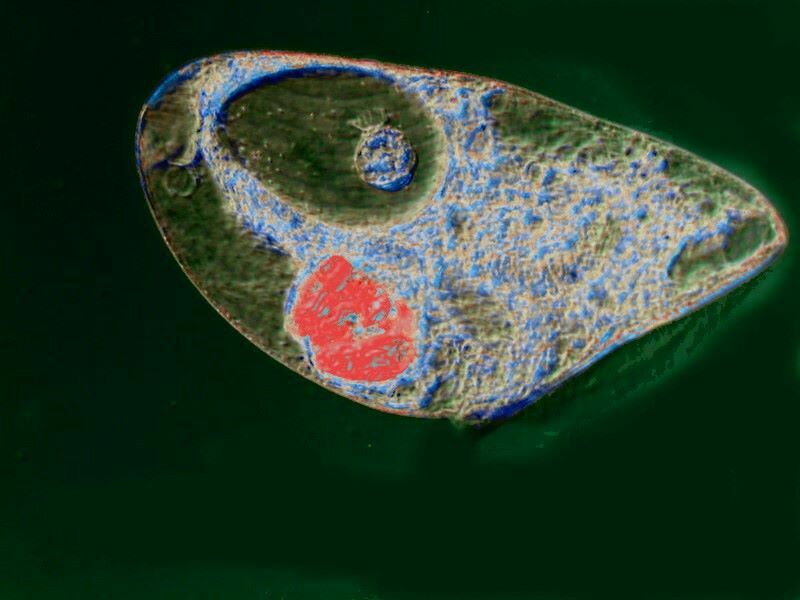 A variety of protists have developed a survival strategy known as encystment. The organism starts by de-differentiating its various structures to ultimately lower its metabolic need to as near zero as possible. The thick double wall of the cyst helps protect it from negative elements in the environment. What here looks like a proboscis or “nose” is gradually integrated and the cyst becomes essentially spherical. 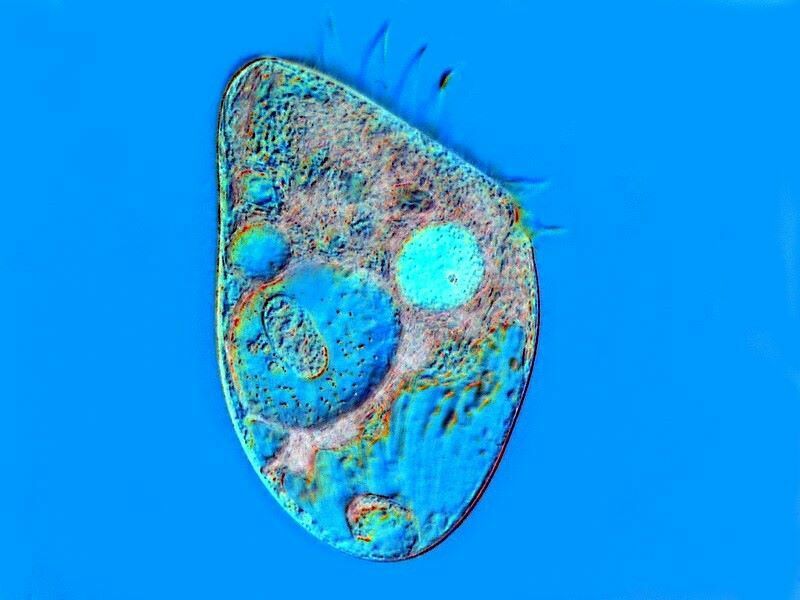 Various protists, tardigrades, and rotifers can all form cysts of varying durability and resistance. In general, they tend to be resistant to heat, cold, and drying. Some of the hardier types are even resistant to radiation and highly toxic chemicals. 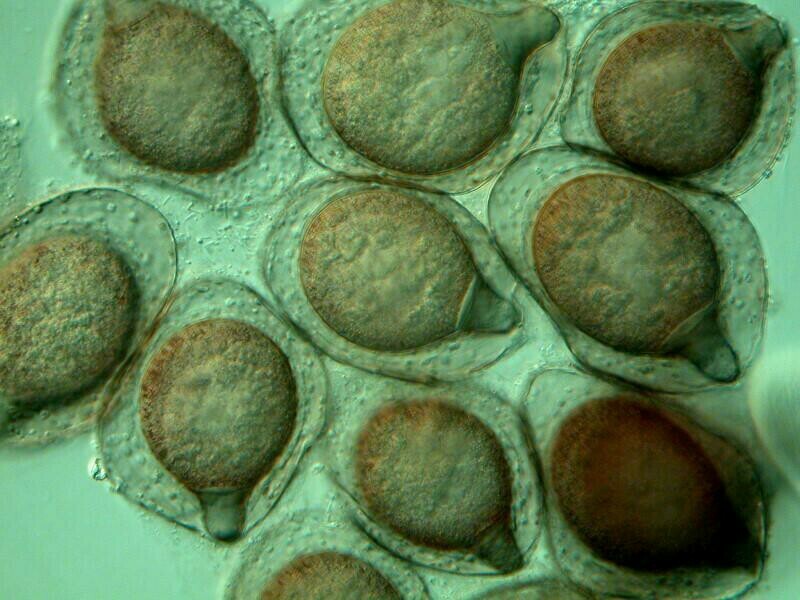 Our Blepharisma cysts are probably moderately resistant. The remarkable thing is that once they have achieved their protected stat of suspension, they still maintain a level of communication regarding the conditions of the environment surrounding their cyst wall. Perhaps, it helps if we think of the cyst as being somewhat like a manned lunar capsule. We sit inside, relatively safe and snug and we have sensors capable of constantly monitoring a hostile and dangerous environment outside our capsule. We, however, are in a situation where we do not expect that environment to change and become hospitable so that we can exist in the capsule without our high-tech gear to keep us alive. We, unlike Blepharisma, cannot modify our morphology. Furthermore, we have very little idea what Blepharisma’s sensors are and how they function. We can, however, bet that there are highly sophisticated biochemical and biophysical mechanisms involved and that there are membranes that are permeable in one direction, but not in the other. Below is an image of a fully completed cyst. 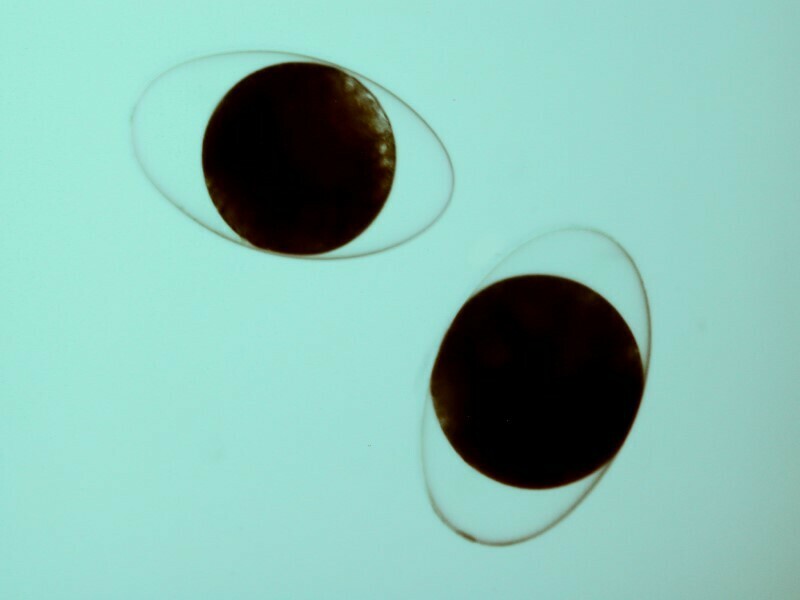 Just to give you an idea of how significantly the formation of cysts can vary, here is an image of 2 Climacostomum cysts. To conclude, I want to show you some images that do, I think, illustrate the fun, desirability, and potential significance of experimenting with the application of certain graphic functions to certain types of images. First is an image to which I applied the “invert” function and then created a stark white background to intensify the colors. The next is a closeup in which the background has been slightly modified to enhance contrast. 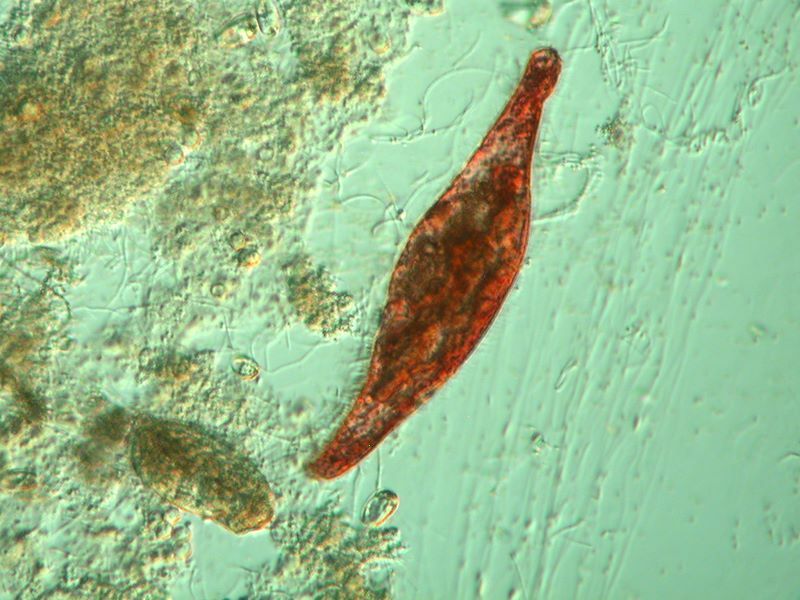 Here in the large vacuole is a Colpidium and in the smaller, a partially digested Blepharisma which is no longer pink, but distinctly red. The final 4 images are a sequence in which the last 3 are variants of the first which, by the way, I used for the closeup immediately above. So, here’s the brightfield image. The next image is an “invert” which creates a pseudo-fluorescence effect and I supplied a black background. The third image is a further modification of the image immediately above which displays a pseudo-darkfield effect. And with the final image, I pulled out all the stops and tried a variety of color modification and was rather pleased with the final result. 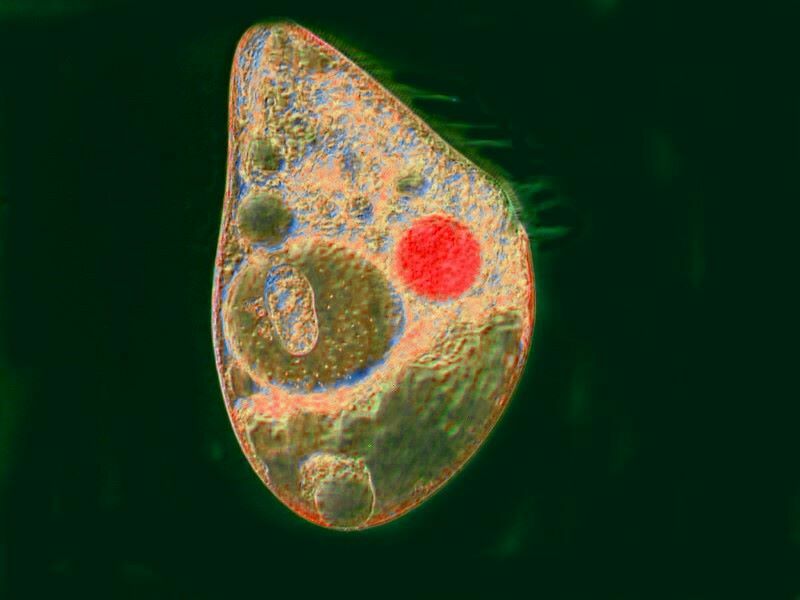 I hope you have enjoyed this brief excursion into the marvelous realm of the pink ciliate and I further hope that you will experiment with using some of the graphic modifications of your software on select images.